For Hindus, there is a single, universal god known as the Supreme Being or Brahman. Hinduism also has numerous gods and goddesses, known as deva and devi, who represent one or more of Brahman's aspects. Foremost among the many Hindu gods and goddesses are the Holy Triad of Brahma, Vishnu, and Shiva, the creator, sustainer, and destroyer of worlds (in that order). Sometimes, the three may appear in the form of an avatar, embodied by a Hindu god or goddess. 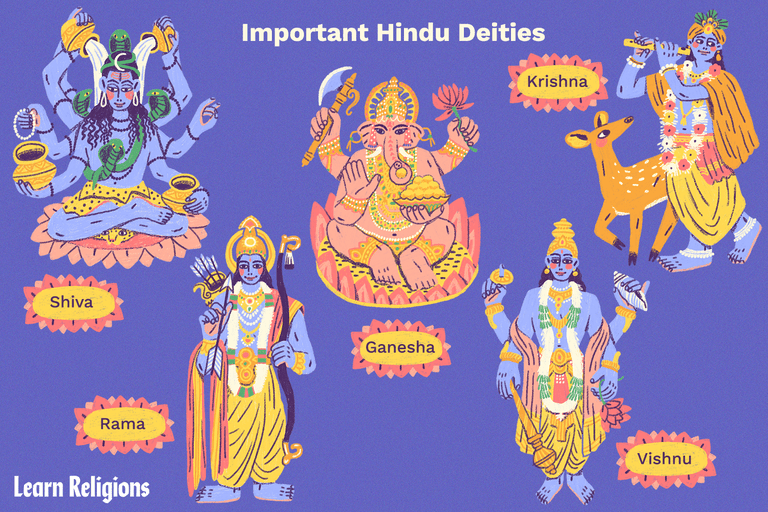 But the most popular of these gods and goddesses are important deities in their own right. The son of Shiva and Parvati, the pot-bellied elephant god Ganesha is the lord of success, knowledge, and wealth. Ganesha is worshiped by all sects of Hinduism, making him perhaps the most important of Hindu gods. He is typically depicted riding a mouse, who assists the deity in removing barriers to success, whatever the endeavor. Shiva represents death and dissolution, destroying worlds so they may be recreated by Brahma. But he is also considered the master of dance and of regeneration. One of the godheads in the Hindu Trinity, Shiva is known by many names, including Mahadeva, Pashupati, Nataraja, Vishwanath, and Bhole Nath. 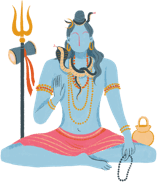 When he is not represented in his blue-skinned human form, Shiva is often depicted as a phallic symbol called the Shiva Lingam. One of the most beloved of Hindu gods, blue-skinned Krishna is the deity of love and compassion. He is frequently depicted with a flute, which he uses for its seductive powers. Krishna is the central character in the Hindu scripture "Bhagavad Gita" as well as an avatar of Vishnu, the sustainer of the Hindu Trinity. Krishna is widely revered among Hindus, and his followers are known as Vaishnavas. Rama is the god of truth and virtue and another ​avatar of Vishnu. He is considered the perfect embodiment of humankind: mentally, spiritually, and physically. Unlike other Hindu gods and goddesses, Rama is widely believed to be an actual historical figure whose exploits form the great Hindu epic "Ramayana." Hindu faithful celebrate him during Diwali, the festival of light. Monkey-faced Hanuman is worshiped as a symbol of physical strength, perseverance, service, and scholarly devotion. This divine primate aided Lord Rama in his battle against evil forces, described in the epic ancient Indian poem "Ramayana." In times of trouble, it is common among Hindus to chant the name of Hanuman or sing his hymn, "Hanuman Chalisa." Hanuman temples are among the most common public shrines found in India. The peace-loving deity of the Hindu Trinity, Vishnu is the preserver or sustainer of life. He represents the principles of order, righteousness, and truth. His consort is Lakshmi, the goddess of domesticity and prosperity. Hindu faithful who pray to Vishnu, called Vaishnavas, believe that in times of disorder, Vishnu will emerge from his transcendence to restore peace and order on earth. Lakshmi's name comes from the Sanskrit word ​laksya, meaning an aim or goal. She is the goddess of wealth and prosperity, both material and spiritual. Lakshmi is depicted as a four-armed woman of golden complexion, holding a lotus bud as she sits or stands upon a massive lotus blossom. The deity of beauty, purity, and domesticity, the image of Lakshmi is often found in the homes of the faithful. Durga is the mother goddess and she represents the fiery powers of the gods. She is the protector of the righteous and destroyer of the evil, usually portrayed as riding a lion and carrying weapons in her many arms. Kali, also known as the dark goddess, appears as a fierce four-armed woman, her skin blue or black. She stands atop her husband Shiva, who lies calmly beneath her feet. Bloodsoaked, her tongue hanging out, Kali is the goddess of death and represents the ceaseless march of time toward doomsday. Saraswati is the goddess of knowledge, art, and music. She represents the free flow of consciousness. The daughter of Shiva and Durga, Saraswati is the mother of the Vedas. Chants to her, called Saraswati Vandana, often begin and end with lessons in how Saraswati endows human beings with the powers of speech and wisdom.